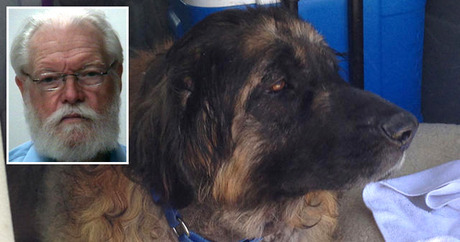 Dr. Lou Tierce (inset) was arrested after he admitted keeping a Leonberger dog named Sid alive rather than euthanize the animal; his license has been suspended and he’s been charged with animal cruelty. Earlier this week, DogTime.com told you about a Fort Worth, Texas, veterinarian who’d allegedly lied about euthanizing several pets at his clinic for the express purpose of using them for blood transfusions. One of these poor pets, 5-year-old Leonberger Sid, was rescued from Camp Bowie Animal Clinic by his shell-shocked family six months after he was supposedly euthanized. Sid’s family learned from a veterinary technician that their dog was alive, that he’d been locked up at the clinic, forced to live in his own waste, the subject of countless transfusions and possible medical experiments. “I remember coming in and them extracting blood from Sid, and basically shaving him, extracting his blood for the other animal upstairs,” vet tech and whistleblower Mary Brewer told the Dallas-Fort Worth FOX affiliate. Brewer says she left her vet tech job because she was horrified by the alleged acts of animal cruelty she witnessed with her own eyes. Authorities raided the Camp Bowie Animal Clinic Tuesday to investigate after receiving a complaint filed by Sid’s owners, Jamie and Marian Harris of Aledo, Texas. Wednesday night around 7 p.m., Dr. Millard Lucien “Lou” Tierce, 71, turned himself in at the Tarrant County Jail, where he was charged with animal cruelty and subsequently released on $10,000 bail, according to the Star-Telegram. His veterinary license has since been suspended by the Texas State Board of Veterinary Medical Examiners. “The lady has her dog back. A year later, the dog is still alive and walking around,” Tierce added. Yet in a handwritten statement, Dr. Tierce admitted to keeping five dogs alive at his veterinary clinic that were supposed to have been euthanized. Those animals have been removed from the premises. Sadly, three of them were in such awful condition that they had to be euthanized. One had been locked in a cage at Tierce’s clinic for three long years after the pet was scheduled for euthanasia. Another of those dogs was Tierce’s own black-and-white Border Collie, who was found in deplorable condition while authorities searched Tierce’s animal clinic Tuesday. Police found the poor dog in an exam room, lying in a box, writhing in pain. Officials tell NBC DFW one of the dog’s legs was missing, and another leg and two shoulders were dislocated. Another vet tech claims the Collie had been in the same condition since June 2013, when she began working at the clinic. Dr. Michael Morris of the Fort Worth Animal Clinic, who has been aiding authorities with the case, says Tierce’s dog was also severely emaciated, suffering from cataracts, a neurological disease, and an untreated mouth condition. The dog was also missing the bottom of one of its feet, Dr. Morris said. In his professional opinion, the dog had been in pain for quite some time and should have been humanely euthanized long ago. Oddly enough, Tierce agrees with Dr. Morris’s assessment. Tierce admitted he had not given his dog any medical attention — only minimal food and water — and he should have gone through with euthanasia. The animal cruelty charge against Dr. Tierce is largely due to his lack of care given to his own dog. As the investigation continues, the state board has declared Dr. Tierce a danger to patients, not only because of the allegations against him and the acts he himself has admitted to, but because of the conditions at the clinic in which he practiced medicine for more than 40 years. Their report describes Tierce’s animal hospital as filthy and cluttered, lacking even the minimal standards for cleanliness. “Animal organs were kept in jars throughout the clinic. Bugs were visible in exam rooms. Stacks of drugs, trash, laundry, paperwork, and other miscellaneous items were strewn about the examinations rooms, hallways, stairwells, operating rooms, laboratories, and offices of the clinic,” the board’s report explains. The report goes on to describe the mountains of unsecured drugs, including several controlled substances that littered the clinic. Despite everything that has come to light this week, many of Dr. Tierce’s clients are coming to the troubled doctor’s defense, including Greg Aston, who has taken his pets to Tierce for many years. And client Sandy Kurtzman even goes as far as to call Dr. Tierce “Saint Lou,” who she says performed a nine-hour surgery to save a Labrador Retriever’s leg. But other former clients are demanding answers from the veterinarian they once trusted with their pets’ lives. Christian Flores says his family’s dog, an American Pit Bull Terrier Tyson, was hospitalized at Camp Bowie for canine parvovirus back in November. Several days later, Flores says his family was told that Tyson passed away. Flores says he was suspicious because he never received a burial or cremation bill after Tyson’s death. “We were not charged; that was a red flag to me,” Flores says. Attorney James Eggleston, who is representing Sid’s family, the Harrises, says he knows of at least three clients, including Christian Flores, who have filed complaints with the state veterinary board this week. Eggleston is certain that others will file in the coming weeks. In the meantime, authorities say the investigation continues.